Faw and Nicker could have co-starred in "What About Bob?" 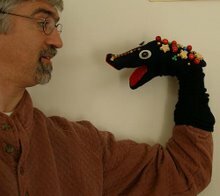 .... cool sock puppets! Kimmie - welcome to Color Sweet Tooth, and thanks for the compliment about these goof balls made from socks. Grenouille will have something to do with Nicker on some future post.